To assess the overall success - and occasional failures - of your SEO efforts, you need to be able to check how your website is performing on search engines, and particularly Google in terms of rankings for your selected keywords. It's no secret that Google is now providing highly personalized search results to users based on their personal browsing history, location, device, and more. While this is great for users, it also made traditional keyword search ranking tools based on scrapped Search Engine Results Pages - SERP, besides being against Google terms of services, simply irrelevant and obsolete. Samba's keyword rank checker is different. We get our data straight from the proverbial "horse mouth" by the way of Google Webmaster tools, ensuring an umatched level of accuracy in our reporting. And while Google offers 90 days of data, SambaSaaS retain the entire search rankings history of websites, offering an unique view of a site search rankings evolution over time. SambaSaaS keyword search ranking checker software is particularly well suited for multi-websites owners and operators such as franchising brands, or marketing agencies. Everyone appreciates checking all key performance indicators across any number of websites in one glance, while drilling down and accessing ranking reports down to individual websites, and keywords over time. With SambaSaaS, you can see instantly critical performance indicators statistis such as the Number of Clicks, Impressions, Click Through Rate (CTR), and Average Position of your targeted keywords in Search Engine Results Pages (SERP). Marketing agencies and business solutions providers can also grant private access to SambaSaaS services to their clients and generate private-label search engine ranking reports for their benefits. Long list of keywords sometimes feel like just like neverending Xmas wishlists. They often miss their point by not appropriately covering key phrases variations, missing out on fast forming trends, and above all proving time-consuming to build and maintain. Contrary to classic search engine rankings reporting tool, SambaSaaS reports on key-phrases for which your websites are appearing on Google search result pages in an automated fashion. There’s no need to insert list of key-phrases, instead you just need to flag keywords you'd like to target, as they start ranking on Google. 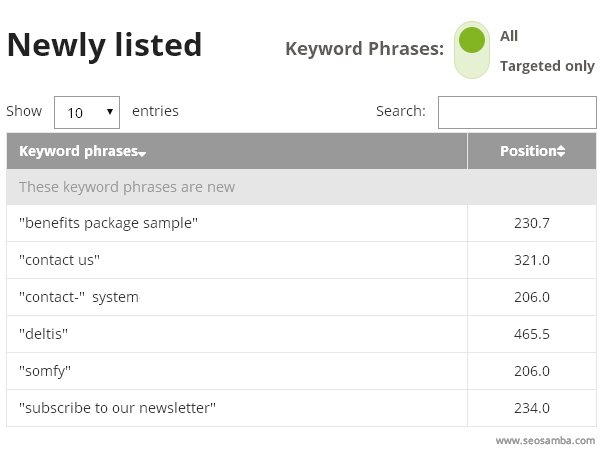 Better yet, if you use our automated optimization engine, then reporting align automatically with your search targets, and we include them automatically in your tracked keyword reports. Target quickly emerging keywords and key-phrases as your website start ranking for them, and let the system flag key-phrases your website has been automatically optimized forwhen you're using the SambaSaaS SEO execution platform. Which keywords are the most efficient for your website? What key phrase generates the most organic traffic? How do your performance in search engines fare compared to your engagement rate on social networks? SambaSaaS gives you an accurate outlook on your overall results, and lets you customize your search engine ranking reports to systematically find dead-center answers to all your questions, whatever they may be. If you're tired of losing time and money juggling with between hotchpotch of free online tools and overpriced proprietary software, SambaSaaS is the all-in-one marketing and SEO execution and reporting solution you've been waiting for. SambaSaaS is a unique cloud-based online marketing platform that helps website owners, developers and online marketers to succesfully execute custom and automatic SEO strategies across one or any number of websites. Closing the loop between execution and reporting, SambaSaaS is the only software that lets you reliably automate and customize your SEO strategies from beginning to end. Provided as a turnkey cloud-based service, SambaSaaS enables cost-effective automated online marketing and multi-sites automatization, news and press release distribution, social media marketing as well as lead tracking and sms marketing.